While CSOs can have a big impact on budget decisions, implementation, and outcomes, this impact is much greater when they work with other actors in the “accountability ecosystem” (i.e., legislators, auditors, citizens, donors, and the media). Therefore, it is important to be aware of the roles of these various actors at the different stages of the budget process. 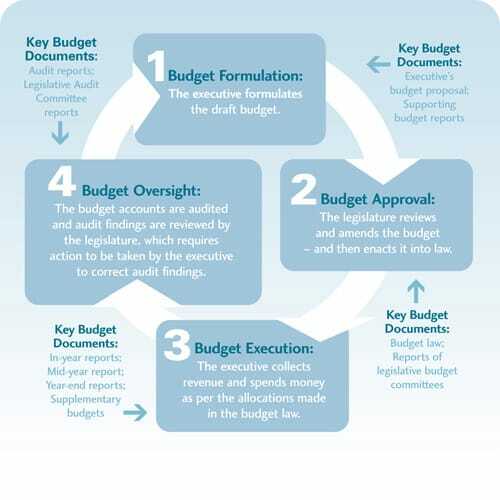 In most countries the budget process is broken into four stages, as shown below, and the different actors play different roles in each stage. The budget formulation stage takes place mostly within the executive. It usually involves departments submitting budget proposals to a central budget authority, such as a Ministry of Finance or Treasury, to come to an agreement within the executive on how available funds for the upcoming year (and sometimes beyond) should be allocated. The role of legislatures tends to be minimal at this stage. Some receive briefings on how the drafting process is developing and on central issues that have emerged. In some countries, medium term budget policy statements are presented to the legislature several months before the budget itself, and a few countries have formal consultations between the legislature and the executive during this stage. Once a comprehensive budget has been drafted, it has to be approved by the legislature to go into effect. The role of the legislature is arguably most obvious during the approval stage, when it scrutinizes the expenditure and revenue proposals of the executive and decides whether to approve, reject, or amend them (if it has the authority to do so). The principle of legislative authorization of all public spending and taxation is also called the “rule of law” in public finance. The presentation of the budget in the legislature is usually the first time that the details of the draft budget are reported widely in the media and become known to the general public. Often, legislative committees have responsibility for in-depth scrutiny at this stage. By providing the legislature with important information about the public’s needs and priorities, CSOs can help legislators more clearly understand issues related to the budget and thus make better decisions. In many countries the legislature has very limited analytic capacity to allow them to rigorously scrutinize the policies and assumptions in the Executive’s Budget Proposal. CSOs can also contribute to the approval process by using their technical skills to analyze the proposed budget and providing this analysis to legislatures. While the execution of the budget is in the hands of the executive, the legislature continues to play a role. Funds are apportioned to spending departments in line with the approved budget. However, it is not uncommon that funds are shifted to purposes other than those for which they were approved. Frequent ad hoc adjustments to budgets can reflect uncertainties in the macroeconomic and fiscal environments, but the need for continuous revisions is also a symptom of a weak and ill-disciplined budgeting system. For this reason, legislatures might closely monitor implementation of the budget by scrutinizing information on actual spending. Under normal circumstances, any significant changes in spending should be approved by the legislature in adjustment appropriations. Following the implementation of the budget, government accounts and financial statements are audited by an independent audit institution, often an auditor general or audit court. Usually, the results of the audit are presented to the legislature and considered by one of its committees, such as a public accounts committee. In this way, legislators can use the insights gained from audit reports to assess future draft budgets. They can also work with CSOs that are monitoring service delivery on the ground to gather critical information on mismanagement or misuse of funds. The oversight demands on the legislature are challenging because budget cycles overlap. At any one time, the legislature might be approving one budget, monitoring the implementation of a previously approved budget, and considering an audit report on a budget that has already been implemented. As watchdogs of public finances, supreme audit institutions (SAIs) act as critical links in enforcing the accountability of executive agencies to national and state legislatures and through them to the general public. The SAI (which may also be called the Office of the Comptroller or Auditor General) reviews financial management of public sector entities to ensure that transactions have been undertaken with due regard to propriety and regularity. Recently, several public auditors have also assumed responsibility for assessing value for money considerations in public projects and programs. CSOs can support SAIs in their assessment of government performance by passing on information about problems in service delivery and possible instances of misuse of public funds. There is a growing trend of SAIs engaging citizens and CSOs in identifying audit subjects and actually collaborating on assessment on the ground. After finishing its review, the SAI reports its audit findings to the appropriate committee in the legislature. The legislature uses the audit findings to examine whether the executive has implemented the budget according to the provisions of the law and is then responsible for acting upon the findings. In many countries, audit reports are made available to the public and the media, which can then utilize the findings to demand accountability from the government. The SAI plays a critical role in combating corruption, facilitating good governance, and fostering more effective public financial management. However, the role of SAIs as public finance watchdogs is still limited in many developing countries around the world. This state of affairs is the result of several factors, including financial and skill constraints, SAIs’ lack of independence from the executive (it is hard to hold someone accountable when they fund you or can unilaterally remove you from office), and poor communication between the SAI and the legislature and civil society organizations. Members of the public are directly affected by government budgets—they are the beneficiaries of publicly funded programs, such as health care and education, and they provide the government with resources by paying taxes. The role that individual citizens play in the budget process varies from country to country, in part due to the availability of budget information and opportunities to participate. However, all members of the public have a fundamental right to be involved in the budget process. Public participation can strengthen policy choices, increase public support for budget decisions, and strengthen oversight, all of which ultimately can improve outcomes, especially for the poor and most vulnerable of a country’s people. Members of the public can provide critical information on needs and priorities and, through monitoring how the budget is actually carried out, can reduce mismanagement and opportunities for corruption, thus further enhancing budget efficiency and effectiveness. Civil society organizations can facilitate greater and more effective public participation through efforts to increase the public’s understanding of budget issues and mobilize it to action. The media plays an important role in the budget process by keeping the public and other stakeholders informed and holding the government accountable by reporting on any differences between what is promised in the budget and what is delivered. The media informs the public and other stakeholders by providing updates on what is happening at different stages in the budget process (e.g., reporting on the release of various budget documents or on significant debates and policy shifts during formulation), covering proposals and reactions from civil society and other interested parties, and discussing important policy decisions. Because of its ability to broadly disseminate information in a timely way, stakeholders in the budget process will seek to use the media as a tool to garner support for their positions. This is why in most countries, governments, civil society, and others regularly hold press conferences and issue statements to the press, especially during the formulation and enactment stages of the budget cycle. In some countries, the media is controlled by the government and so may play a more formal role in terms of publicizing the government’s positions. However, in these countries, the media generally will provide little to no independent oversight. Civil society organizations can promote their agendas and help to strengthen the capacity of the media to cover the budget by providing background briefings, reports, or even training courses on budget issues. Donor countries and institutions that provide critical financial assistance to countries have a huge amount of influence on how aid-recipient governments govern, including how they manage public resources. The good news is that most international donors are now committed to supporting governments—and increasingly CSOs—in their efforts to reform how public finances are managed. Many now recognize budget transparency, public participation, and government accountability as ingredients crucial to reforms that can better deliver public services and relieve poverty. There are a number of ways in which bilateral and multilateral donor organizations can affect budget transparency and accountability in aid-recipient countries. They can provide incentives that encourage governments to make budget information publicly available, for example, by committing to channel more of their aid directly into the government budget in countries where budgets are more transparent, or by demanding that specific transparency benchmarks are met before aid funds are disbursed. Donors can also provide technical assistance and funding to support the introduction of comprehensive information systems that allow governments to produce accurate and timely budget information, or the creation of information disclosure systems that facilitate the dissemination of fiscal and service delivery information to the public. Furthermore, they can support the efforts and build the capacity of domestic accountability actors (legislatures, audit institutions, civil society, and the media) in demanding that their governments disclose fiscal information, and in making better use of existing fiscal information to hold the executive accountable. Finally, donors can be more transparent themselves about the aid they provide. Aid transparency and budget transparency are inextricably linked. Budgets in partner countries cannot be made fully transparent without improved aid transparency. Only if donors provide partner countries with sufficient information, compatible with partner country budget systems and schedules, can timely, accurate and comprehensive budget information be made available to citizens of countries receiving aid.